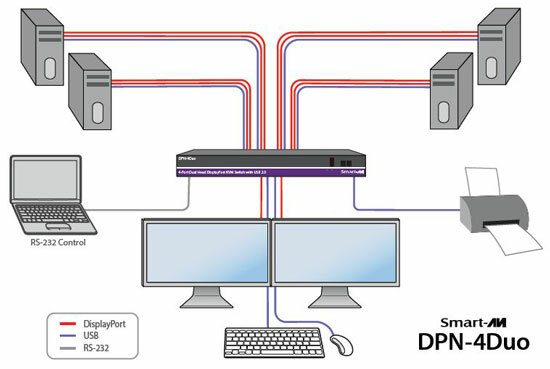 The SmartAVI DPN-4Duo is a dedicated multi-platform 4K KVM switch capable of managing four dual-head computers through two DisplayPort monitors, one USB keyboard, one USB mouse, and other USB 2.0 devices. The dual-head compatibility of the switch enables increased workflow capabilities. DisplayPort is one of the latest options in screen connectivity that delivers top quality highdefinition video, and this device is DisplayPort 1.2 complant with support for screen resolutions up to 3840x2160 (@30Hz). HDMI and DVI video connections are supported with the proper video converters, and the device is backwards compatible with prior DisplayPort versions. The DPN-4Duo provides a simplified management approach for four DisplayPort equipped computers USB 2.0 outputs for a keyboard, mouse and other USB peripheral devices such as a printers and flash drives. 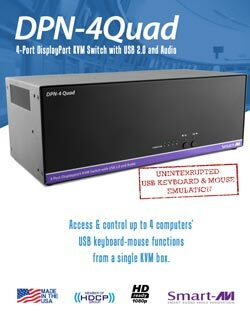 This dynamic KVM console can be controlled keyboard Hot Keys or RS-232 commands, as well as directly through the console's easy-to-read front panel. EDID Pass-Through technology enables smooth and efficient switching, making the device easy to implement in virtually any scenario. Question: On Smart-AVI's website, this description is shown as - Supports resolutions up to 3840x2160 (@30Hz), not @60Hz as you show it. Answer: Thank you for your inquiry. We are updating our webpage to reflect the newly available refresh rate information. Question: Does the display port 1.2 compliance include multistreaming to chain an additional monitor off the first display port connection? Multistreaming (MST) is is not supported on the DPN-4PDUO, but may work on certain monitors. 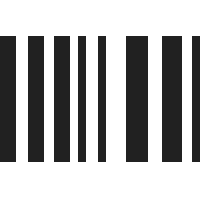 The DisplayPort signal is processed along the way so most of the time the datalanes do not have a transparent 1-1 connection. Unfortunately we are unable to recommend a solution with MST as this is not a feature that our vendors support; We would generally recommend avoiding cascading DisplayPort monitors when connected to a KVM - you can achieve multi screen setups over individual video connections. Question: What is the guarantee period ? Answer: Thank you for your inquiry. All new Smart-AVI products come with a standard 1 year warranty for defects in materials and workmanship. Question: If this device is for four PC connections, why are there 8 different input ports? For a 4-port single-monitor version of this switch, please see the SmartAVI DPN-4P. Question: How would I connect source computers since the cable recommended for this device (CCDPMMKVM-06-S) only has a single (not dual) Dport connection per cable? Please advise? This DPN-4Duo KVM would require (1) CCDPMMKVM-06-S + (1) DisplayPort cable (i.e. C2G 54401) per source computer - so a total of 4 of each cable for 4 dual monitor sources.